SunPower Corporation is in the midst of a huge transition year, and the biggest changes will come in the company’s power plant business. The company can’t be profitable on residential and commercial projects alone, so it’s investing heavily in P-Series solar panel manufacturing and its Oasis power plant system in an effort to grow in utility-scale solar. The biggest news from the first quarter earnings report was that SunPower is building as much as 5 GW of P-Series capacity in China. And the company is leveraging partnerships in China to grow. If successful, SunPower could become one of the biggest utility solar companies in the world. Here’s what the strategy looks like. P-SERIES PANELS MAY MAKE SENSE IN LARGE, COMMERCIAL INSTALLATIONS. IMAGE SOURCE: SUNPOWER. The first joint venture SunPower expanded recently was a business that bought 1.2 GW of mono-PERC manufacturing capacity in China. In total, SunPower invested $18.2 million in the company for a 20% stake; Dongfang Electric Corporation and Tianjin Zhonghuan Semiconductor own the rest. And these two partners will control the production, including building up to 5 GW of P-Series panel capacity in China. One-third of the capacity coming from the joint venture will be going to North America, one-third will be sold in China, and one-third will be sold to another joint venture controlled by SunPower. It’s this second joint venture, which is 80% owned by SunPower, that could be most consequential. The JV will sell Oasis power plant solutions around the world that use these panels, and should be able to win its fair share of business in a highly competitive global market with very little capital spent to build capacity. If the China JV reaches 5 GW of production annually as planned, SunPower would be allocated 3.33 GW of solar panels from China and at least 400 MW from Mexico — although by 2021, that plant will likely ramp production up to 1 GW a year if the product is successful. Selling 4.33 GW of utility-scale solar solutions annually could be a huge win, even if the business generates a relatively low gross margin of around 15% on $0.75 per watt in sales. The nearly $500 million in gross margin that would amount to could be enough to make SunPower profitable. 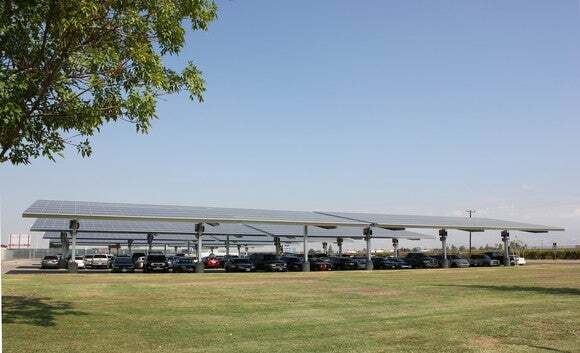 SunPower has said that the mono-PERC and P-Series manufacturing facilities will allow it to introduce a P-Series panel called P19 later this year. Right now, the company offers a multi-crystalline cell base P17 solar panel that ranges from 16%to 17.2% efficiency, according to public data sheets. If the P19 series can hit 19% efficiency or higher, and be cost-competitive, it could make a huge difference for the company’s position in the marketplace. The P19 product is also notable because it beats the 18% efficiency level First Solar (NASDAQ:FSLR) says it will hit with its Series 6 module upgrade. First Solar may be able to improve its product from there, but if it’s behind the competition out of the gate, that’s not a great sign. SunPower has a strategy that looks like it might work in the utility-scale solar segment, and it’s leveraging partnerships in China to turn itself into a worldwide supplier at scale. This could certainly work for Sunpower, hopefully a does, but all eyes will be watching this JV and the potential success it brings for all.